I have always had a need to shape and influence the environment in which I live. This is what drives me as a woodworker, as well as what led me to farming. 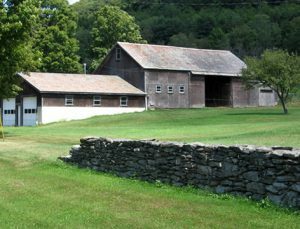 I had a small farm in Connecticut, prior to moving to Vermont and farming on a larger scale. Farming and carpentry go hand in hand. I can’t imagine running or owning a farm without the love, or ability to be able to spend the majority of one’s time fixing and or building things. 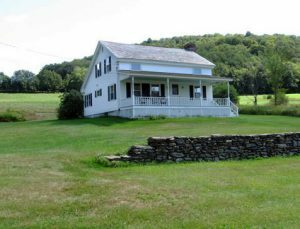 If one is farming on a small scale, especially in the Northeast, chances are that you are living in an old house. While I am naturally drawn to these vernacular beauties, they are not without their headaches. 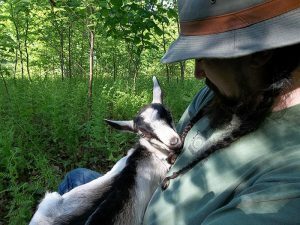 From shoveling snow off of the slate roof and cutting seven cords of firewood in winter, to repairing rotten wood in summer, they are enough in themselves to occupy the majority of one’s time. This doesn’t even take into account the barn! While a few leaks here and there are acceptable, so many of these beautiful New England landmarks have given into the ravages of time for the simple reason that no one has taken the time to maintain their roofs. My first advice to anyone who wishes to undertake livestock farming, especially goats, is do not build too much inside your barn before you get your animals. Animals are intense critics of design and architecture and they will quickly inform you of what is absolutely unacceptable. 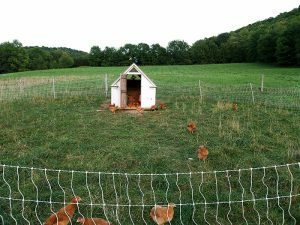 Chickens on the other hand, are a little more easy going about their housing. 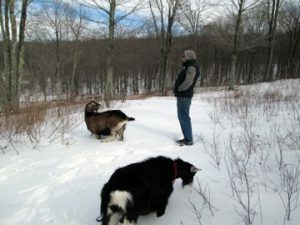 I am a firm believer in Joel Salatin’s holistic approach to farming. 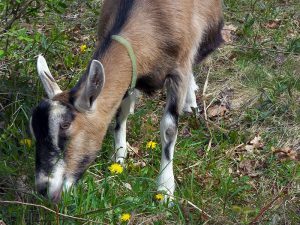 The idea that you are trying to create a mutualistic system in which you primary concern is the management of your pasture, while having animals rotate behind one another for best pasture use, fertilization, and control of parasites. This is a happy group of ready rangers picking through an eaten down goat paddock. Despite its obvious difficulties, there is no doubt that farming is one of the most rewarding things that I have ever undertaken. It has its bizarre moments however. This little guy that I am feeding had to live in my basement for a month, having been near death at birth. 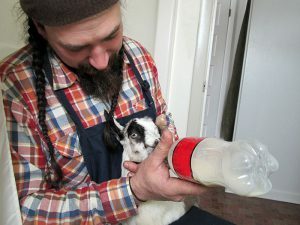 People give you strange looks when they arrive at your house to the sounds of a baby goat rising through the floor boards. 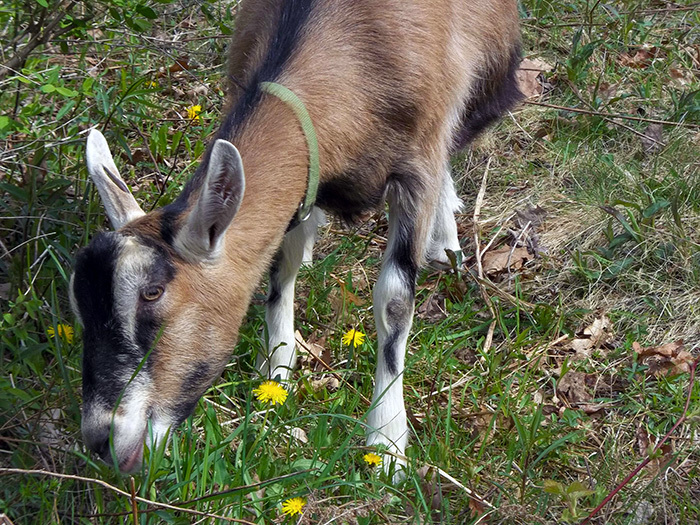 Once returned to the barn, it took a little while for him to realize that he was a goat. There are plenty of idle times too. 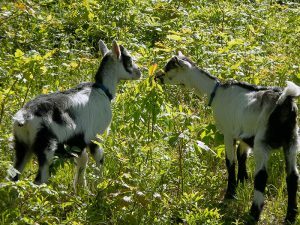 The wonderful thing about raising goats in particular is that they are pack animals, used to being guided by shepherds. This means long walks in woods and fields, unencumbered by fences. There is ample time to sit, reflect, and get to know one another more intimately. When farming, much like when working on houses, seasons are simply a measurement of time. Weather does not excuse you from daily chores. I spent just as much time outdoors working during the winter months as i did during the summer. When you are surrounded by animals that have nothing but each other to keep warm, it is hard to find an excuse to hide inside, no matter how hard the wind might be blowing. 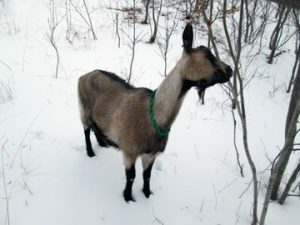 Snow can be a bit of a deterent to some animals. 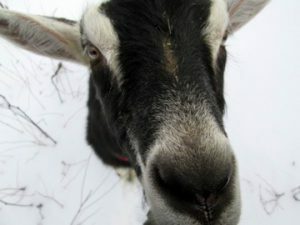 The chickens would rather stay inside huddled on there roosts, but goats will never give up the opportunity for a little wander, and the joy of nibbling on some dormant spring tree buds. Nathaniel Brawley Hill is the owner of Brawley Made - a fine woodworking brand of individually handcrafted furniture and architectural millwork, based in Downtown Los Angeles.